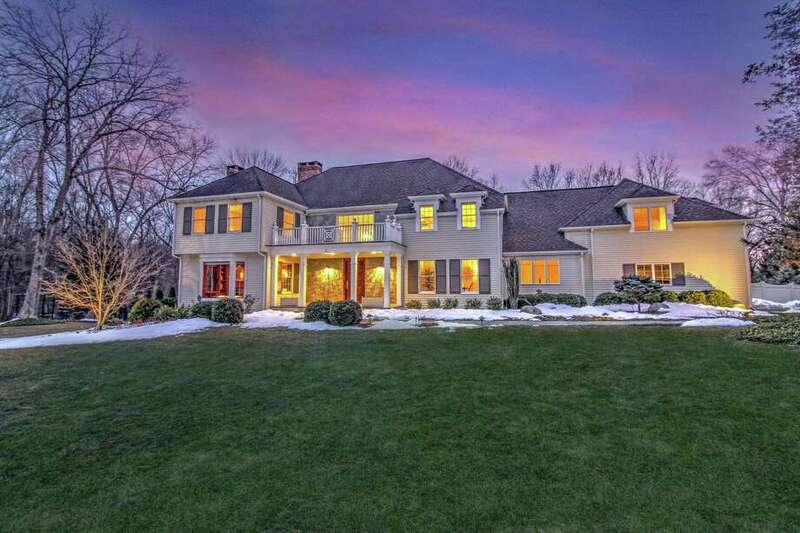 The Energy Star-rated white colonial house at 2 Arrowhead Way in Lower Weston sits on an attractively landscaped level property of 3.59 acres near the end of a cul-de-sac. WESTON — Changing weather has influenced the behavior of Fairfield County residents. Before Superstorm Sandy devastated the region in October 2012, only a small number of residents owned a generator. Post Superstorm Sandy generators have become standard equipment. The Energy Star-rated, white colonial house at 2 Arrowhead Way in Weston does have a generator, although it is unlikely to ever need it because the utilities in this Lower Weston neighborhood are underground. There is no danger of tree limbs falling on power lines during a major storm and knocking out power. Beyond that fact, there is another benefit to having underground utilities — no unsightly power lines to obstruct the surrounding view of this attractively landscaped level property of 3.59 acres. It’s best to have a generator anyway in case of any emergency, following the Girl Scouts and Boy Scouts mottos, both of which are “Be Prepared.” This house is not just prepared for emergencies. When it was built in 1986, it was also furnished with many amenities allowing it to host luxurious, as well as casual, living and entertaining, whether on a grand scale or for intimate gatherings. The generous proportion of the rooms and the open layout makes for an ease of movement from one room to the other. The house has been renovated, updated and meticulously maintained, its pride of ownership evident throughout, according to the listing agents. The custom millwork and other architectural details add to the visual impact of the home. The Lutron Grafik eye lighting system and other features have brought the house into the 21st century. It features 10 rooms and 4,953 square feet of living space, and that’s just on two finished floors. There is a wealth of additional space in the full basement that could be finished creating a number of living, entertaining and recreational options. And it almost goes without saying that there is an abundance of storage space in the basement and elsewhere. The house sits near the end of a cul-de-sac in a private neighborhood association on the Westport line. Its convenient location puts this house only minutes from the Merritt Parkway, downtown Westport, and the Saugatuck Metro-North train station for easy commuting. A long driveway leads passed the expansive front lawn to the attached three-car garage, ample parking area, and the bluestone path to the covered front porch. Inside, the sizable two-story foyer provides access to the spacious formal living room to the left and the formal dining room to the right. In the living room there is a fireplace with a Vermont Verde marble surround and flush fluted columns framing the built-in shelving. The two-story family room features a fireplace, built-in shelving and cabinetry, and French doors to the multi-tiered Ipe deck, backyard and semi-circular Gunite In-ground swimming pool and spa. The chef’s eat-in kitchen features new quartz counters, a breakfast bar, a built-in desk area, two-story breakfast nook with walls of windows, and high-end appliances. Off the kitchen there is an office with a wall of built-in shelving and stairs to a large bonus space above the garage. This room has flexible use as a game, play or recreation room. It could also serve as a fifth bedroom, if necessary, as allowed by the current septic system size. It has a full bath and a walk-in closet so it could also serve as an in-law or au pair suite. All four existing bedrooms are found on the second floor. The large master suite features a sitting area, walk-in closet and spa-like marble bath with a vaulted ceiling, double vanity, jetted tub, and shower. One of the bedrooms has a built-in window seat and another has a desk are with shelving above it. In addition to the master, one bedroom is en suite; the other two share a Jack-and-Jill-style bath. Visit 2Arrowhead.com for a 3D virtual tour and videos, and www.LeslieRiback.com for more information. To make an appointment to see the house contact Leslie Riback and Inna Agujen of Coldwell Banker Riverside Residential Brokerage; Riback at 203-858-1795 or leslie.riback@gmail.com, and Agujen at 917-607-6385 or inna.agujen@gmail.com.